Do dental implants make you nervous? Placing dental implants is one of Dr. Camp’s favorite things to do. He is very passionate about placing implants because it gives him the opportunity to create a brand new tooth that cannot decay and minimizes other dental problems. Because dental implants are made from titanium, bacteria can no longer stick around and make a cavity. However, gum disease can still be a problem, so flossing and brushing is still a must. Most of our patients agree that this is not a painful procedure and it is a lot easier than having a tooth extracted. If you are facing tooth loss or an extraction, you probably have many questions about replacing your tooth, whether it is necessary, and what is best for your oral health. At Charlotte Progressive Dentistry, we understand your concerns and look forward to answering all your questions when it comes to tooth loss and tooth replacement options. 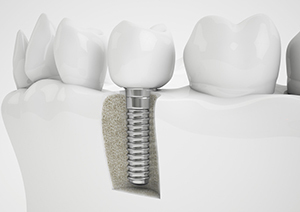 Dental implants are cylindrical biocompatible titanium screws that support a dental crown with the intention of completing your chewing surface and smile. Biocompatible metals can integrate naturally with your body and “fuse” together, creating a stable bond. That is why many dentists consider dental implants to be one of the most effective tooth replacement options available today. Unlike most dental offices, we can place most of your dental implants here at Charlotte Progressive Dentistry without the need for a referral. When we surgically place your dental implants in your jawbone, your body’s natural healing process will take over. 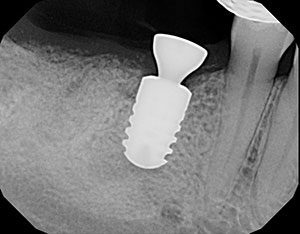 After several months, your dental implant and your bone will have enough stability to support a custom dental implant crown. 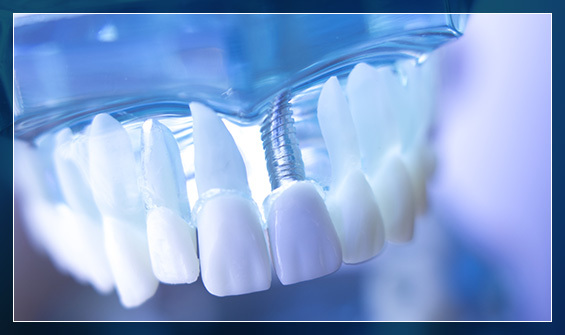 Your dental implant crown is the only part of your implant that people will see. Because we custom create dental implant crowns to match your existing smile, it will appear seamless and look natural! Dental implant placement requires two surgeries. First, we surgically place your implants in your bone and allow them to heal and integrate with your natural bone. Next, we uncover the top of the dental implants in order to place your abutment and crown to complete your chewing surface.